Celebrating America’s birthday in the city where our freedom was born is pretty much as patriotic as it gets. 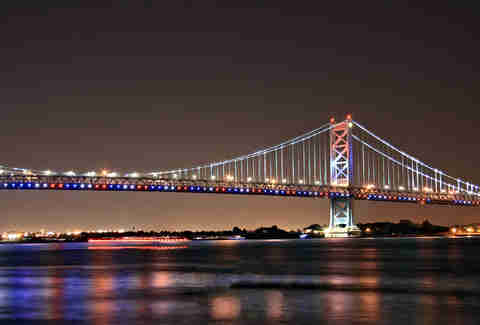 Philadelphia has the reputation for going all out every Fourth of July, putting on week-long celebrations that include festivals, concerts, and events like Philly @ the Movies, Free Museum Day, and sponsored happy hours around the city. Now, cue the fireworks: this year’s pyro display over the waterfront will be the biggest in over 10 years -- so naturally you won’t want to miss it. With that, here’s everything you need to know about getting front row seats to the show and having a seriously lit July 4: from stake-out spots to transit must-knows and watering holes that boast views (without the crowds). Where and when do the fireworks start? The Wawa Welcome America! Fourth of July fireworks show is taking place above the Philadelphia Museum of Art and kicks off at 9:30pm after two hours of musical performances, and while it’s free to the public, it’s not the only game in town. There’ll also be another (also free) fireworks display happening to the east above the Delaware River, thanks to the Freedom Festival in Camden, New Jersey: that one’s also happening at 9:30pm, by the way. The Welcome America! music begins at 7pm at 2451 Benjamin Franklin Parkway by The Oval in Philly, and features performances by Mr. Worldwide (aka, Pitbull), Philly POPS BIG Band, award-winning Heather Headley, and more. Philly literally hosts an all-day pregame to the show: it’s called Party on the Parkway, and is one of America’s largest free festivals. 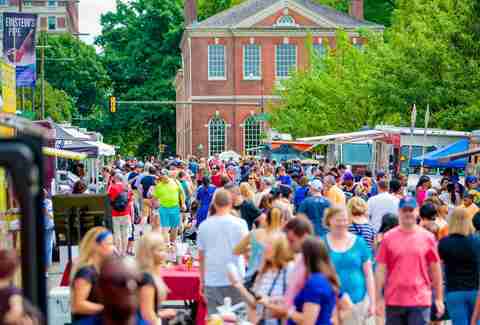 Starting at noon, you can begin your whole afternoon of snacking, drinking, and zip-lining your way down the Benjamin Franklin Parkway. Here’s what to expect: endless nomz from 40 of Philly’s best food trucks (including Mama’s Meatballs and Joe’s Steaks), beer gardens sponsored by Barefoot Wine, musical entertainment on three stages, arts and crafts for the kiddies, an acro dunker show, a zip line... oh, and huge crowds. Looking to watch the show in the center of it all? Get settled on the Parkway/Benjamin Franklin Bridge anywhere between Logan Circle and Eakins Oval, since the entire road will be shut down to cars (but be sure to get there early to set up shop). Other solid viewing options include Schuylkill River Boardwalk, Kelly Drive, Paine’s Park, and the Schuylkill Banks, which features plenty of grass on which to set up picnic blankets, plus an unbeatable view of the Philadelphia Museum of Art. Want your fireworks with a side of kebabs? Fire up the grill at historic Lemon Hill Park’s picnic area, where the hilly topography allows for epic views. If you’re coming from the suburbs and looking for an easy exit, stake out a spot on Martin Luther King Drive (which comes with additional views of all-lit-up Boathouse Row). Hate crowds? Perch on Girard Avenue bridge for great skyline peeping or bring lawn chairs to Fairmont Park in West Philly (these elevated fields also make for great vantage points). Should I drive or take the train? If you’re thinking about driving into the city, you may want to think again. With Party on the Parkway, there will be tons of road closures on, well, the Parkway, plus parts of Martin Luther King Drive and partial detours on streets surrounding the Philadelphia Museum of Art. Save money and a headache: check SEPTA regional railroad holiday schedules if you’re coming from the ’burbs and PATCO schedules if you’re hailing from South Jersey. If you insist on traveling via automobile, take Uber or Lyft and have your driver drop you off at either 22nd and Arch or 22nd and Spring Garden (and expect surge pricing). 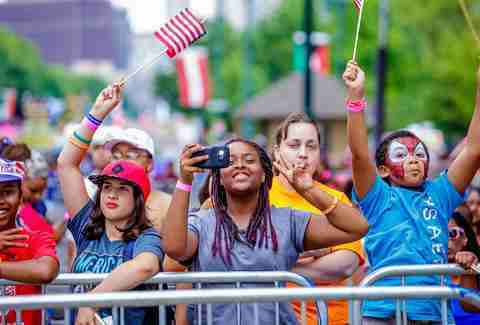 If you have more questions, send a tweet to @July4thPhilly. How should I prepare? What will the weather be like? July in Philly can be toasty, with average temps in the mid-high 80s (plus some of that east-coast humidity). Prep for the day by donning your best red, white, and blue garb, drinking lots of water to stay hydrated, and wearing sunscreen if you’re joining for the daytime festivities. Where are good venues to eat and drink with a view of the fireworks? This ground-level bistro has a few outside tables that’ll offer decent firework viewing, but they’re bound to be in high demand. 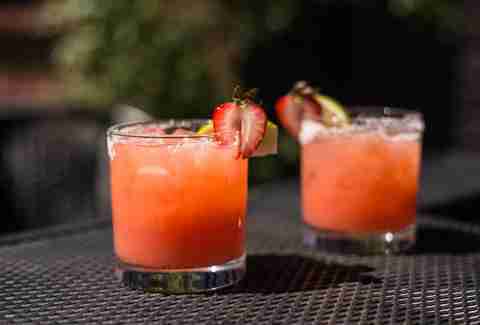 Grab one early and make it an all-day affair with Bloody Marys from 11am-3pm and happy hour from 4pm-7pm, followed by a BBQ pulled pork dinner. Located literally on the parkway -- OK, maybe not literally -- this dive bar has a decent patio and cheap happy hour deals, both of which make it prime real estate for watching the show. The historic Bok building’s rooftop terrace gives you unbeatable skyline views which, paired with the food menu’s light bites and a draft beer from the bar, make for an excellent fireworks-watching experience. 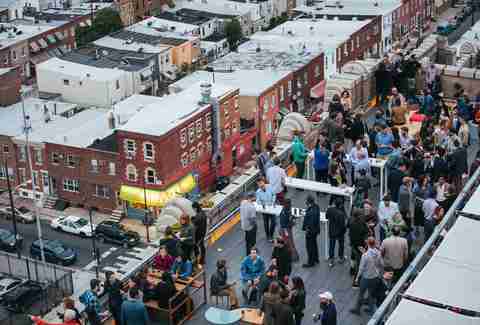 Enjoy open-air views of Philly’s art district -- and the fireworks over the Art Museum -- from nine floors up, sipping a glass of bubbles in an upscale environment (with fire pits). Naturally, you’ll want to get here early to score a viewing spot. Don’t want to cross the river to see things go “boom”? 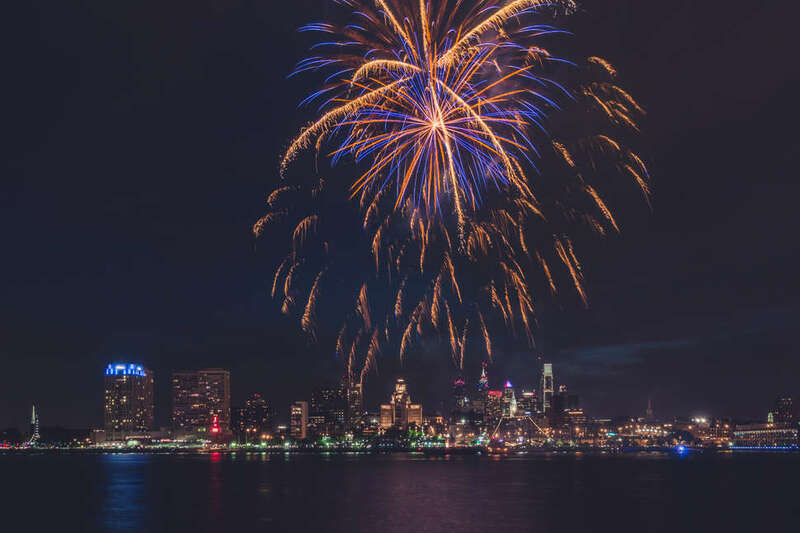 The Freedom Festival in Camden will launch its own fireworks spectacular over the Delaware River starting at 9:30pm, starting with waterfront musical performances from The Spinners and Eddie Money at 7pm. The world’s oldest four-masted ship has been renovated into a fine dining restaurant, which makes it perfect for viewing fireworks on the Delaware. If you’re on deck for the Fourth, expect al fresco cocktails, American Cuisine, and the kinds of waterfront views you can only get from actually being on the water. How can I watch the show live from home? If you’re similar to a house cat in that loud noises and people aren’t your thing, you can always choose TV viewing over fun and tune in to NBC10 or Telemundo62 (but seriously, you’re missing out!). Both networks have sponsored the celebration for 26 years, so at least they’ll hook you up with exclusive, all-access coverage to the event. If you’re a millennial, don’t fret: you can live-stream select events on the network websites and mobile apps, or watch via Xfinity On Demand. Brooke Sager is an American contributing writer for Thrillist (more specifically, a Philly-area transplant from NYC). Her favorite colors are red, white, blue, and rosé. Follow her adventures on Instagram and Twitter: @HIHEELZbrooke.